Tag Archives for " Brick And Mortar Business "
The one on the left I like to call the Highly Networked Business – In this model the business takes full advantage of the use of multi-media, education based content as a driving marketing strategy, taps online automation and search for leads, and utilizes the full suite of social networking and bookmarking tools to create the greatest web presence possible. This is certainly a newer model and one that has been fostered by the tremendous growth of the Internet. This is a powerful business building strategy for Internet based services as well as offline, brick and mortar local businesses. The graphic on the right represents another kind of business, something I call the Highly Engaged Business. 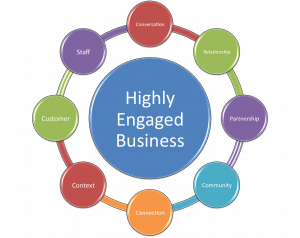 The Highly Engaged Business represents the use of some of the more traditional business building skill sets such as relationship building, strategic partnering, viewing staff as customers, and generally engaging prospects and customers alike in ways that foster deeper connection, context, and community. A lot of successful businesses are very good at one of these models or that other. In fact, every business should adopt the tools, tactics and habits of one of these models or the other in order to succeed in today’s business environment. However, as I’ve been interviewing dozens of successful companies as part of the research for my new book on referrals, I’ve discovered that companies that generate a significant portion of their business by way of referral have something in common with regard to these two models. 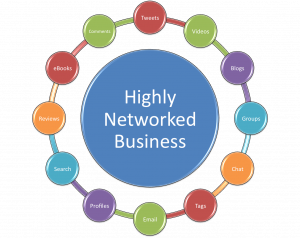 Companies that generate lots of referrals tap the convergence of the Highly Networked Business and the Highly Engaged Business to create something I’ve begun to call the Highly Preferred Business. The Highly Preferred Business uses every advance in technology combined with what one of my referral success stories calls hugs and handshakes to build trust, generate inbound leads, create fulfilling customer experiences, increase customer loyalty, shorten sales cycles, charge premium pricing, create a culture of buzz, and grow to expect referrals from every single customer relationship. These businesses have developed habits the make them both preferred and referred. I believe these habits of preferral can be learned, instilled and installed in any business, online or off. I would love to hear your take on the theory of preferral.